The oral cavity is inhabited by complex microbial communities forming biofilms that can cause caries and periodontitis. Cell-cell communication might play an important role in modulating the physiologies of individual species, but evidence so far is limited. Here we demonstrate that a pathogen of the oral cavity, Aggregatibacter actinomycetemcomitans (A. act. ), triggers expression of the quorum sensing (QS) regulon of Streptococcus mutans, a well-studied model organism for cariogenic streptococci, in dual-species biofilms grown on artificial saliva. The gene for the synthesis of the QS signal XIP is essential for this interaction. Transcriptome sequencing of biofilms revealed that S. mutans up-regulated the complete QS regulon (transformasome and mutacins) in the presence of A. act. and down-regulated oxidative stress related genes. A.act. required the presence of S. mutans for growth. Fimbriae and toxins were its most highly expressed genes and up-regulation of anaerobic metabolism, chaperones and iron acquisition genes was observed in co-culture. Metatranscriptomes from periodontal pockets showed highly variable levels of S. mutans and low levels of A. act.. Transcripts of the alternative sigma-factor SigX, the key regulator of QS in S. mutans, were significantly enriched in periodontal pockets compared to single cultures (log2 4.159, FDR ≤0.001, and expression of mutacin related genes and transformasome components could be detected. The data show that the complete QS regulon of S. mutans can be induced by an unrelated oral pathogen and S. mutans may be competent in oral biofilms in vivo. Streptococcus mutans (S. mutans) has been isolated from caries lesions in 1924 and was consequently considered the etiological agent of caries, consistent with Koch`s postulates . Its physiological properties were since then analysed in great detail and were in accordance with a role as primary causative agent of cavities . Cultivation independent studies, particularly metagenome and metatranscriptome analyses, have completely revolutionized our understanding of oral diseases like caries and periodontitis. They clearly show that S. mutans is only a tiny component of the active oral microbiome. Even in caries lesions, it accounts for less than 1% of the active microorganisms [3, 4] and the onset of early childhood caries can be predicted by the presence of Prevotella spp. but not S. mutans . The etiology of caries is therefore one of the prime examples for the paradigm shift from Koch´s postulates towards the concept of a polymicrobial origin of disease caused by a shift in the composition and metabolic activity of a complex community towards dysbiosis . It is thus important to understand the mechanisms that contribute to dysbiosis development and this will provide novel concepts for treatment . For example, modifying the interaction pattern could potentially have complex downstream effects on the community . Cell-cell communication might be one of the mechanisms that can tip the balance between health and dysbiosis . Oral biofilms are hot spots of cell-cell communication due to the high species diversity, the physical contact between adjacent cells, and large metabolic activity of the community . S. mutans is a good model organism for studying the role of QS in oral biofilms because the functioning of its QS system is relatively deeply understood and some of its characteristics are conserved. In streptococci, short hydrophobic peptides induce competence via a RGG type transriptional regulator . These peptides have been shown to mediate interspecies communication , and have been exploited for antibacterial strategies [7, 12, 13]. Communication can be induced by environmental signals and change the resistance of the bacteria towards cell wall degrading lysozyme . However, it is currently not known if streptococci, or S. mutans in particular, are competent in their natural habitats in vivo, i.e. in the human or animal host. Metagenomics is not informative in this respect, since it only shows the presence of the DNA, but competence is a strongly regulated phenotype. Sequencing of the total mRNA of the microbial community provides information which genes S. mutans is actively transcribing in vivo. Therefore we searched the published metatranscriptomes of periodontal pockets [15–18] for transcripts from S. mutans and A. act. and investigated if the competence regulator SigX and downstream genes are expressed in the natural biofilm under the prevailing conditions and in the presence of the complex oral microbial community. S. mutans synthesizes two quorum sensing (QS) signals, competence inducing peptide (CSP) and sigX inducing peptide (XIP) that are sensed through a two-component signal system (ComDE) and a Rgg-type intracellular transcriptional regulator (ComR), respectively . Upon activation of ComR through binding of XIP, transcription of the alternative sigma-factor SigX is induced . We recently showed that CSP controls transcription of mutacins only, thus we suggest to rename it mutacin inducing peptide (MIP) . The regulon of SigX in S. mutans includes not only the transformasome machinery mediating genetic competence, but also mutacins whose transcription is controlled by the ComE response regulator . Thus SigX is the central regulator of QS in S. mutans. It is not known if sigX is expressed in vivo. Moreover, natural conditions under which MIP is synthesized are unknown. We previously demonstrated induction of sigX by the human pathogenic fungus Candida albicans; both transformasome and mutacins were upregulated in co-culture, in accordance with the central role of SigX in S. mutans [20, 21]. Here we now ask if inter-kingdom communication between S. mutans and C. albicans is an exception, or if S. mutans might be able to communicate with other members of the oral microbiome. We studied its interaction with Aggregatibacter actinomycetemcomitans (A. act). This pathogen has been regarded as etiological agent of aggressive periodontitis for decades, but today is found to be a minor component of the oral cavity  while periodontitis is regarded as a polymicrobial infection , similar to the situation with S. mutans and dental caries. For species to interact in the oral cavity, their co-localization in vivo is essential. Only recently has it been possible to observe such co-localization with genus-level taxonomic resolution. In dental plaque samples, interestingly, Aggregatibacter spp. and Streptococcus spp. were found as dense aggregates at the tips of abundant hedgehog structures . Thus studying interactions between S. mutans and A. act. might reveal mechanisms contributing to biofilm development in the oral cavity. A. act. is doomed to co-operate. It entirely depends on other oral microorganisms to grow in saliva . A “food for detoxification” interaction has been unraveled between A. act. and the commensal S. gordonii . S. gordonii excretes lactic acid, which A. act. uses as a carbon source, and hydrogen peroxide, which A. act. detoxifies, and in a murine abcess model both species are more virulent together than alone . Cocultivation with S. gordonii triggers expression of the complement resistance protein ApiA in A. act. and in such a way increases its resistance to host innate immunity . Here we analysed the interaction between S. mutans and A. act. in dual-species biofilms. We monitored induction of SigX of S. mutans using a PsigX-GFP reporter strain . To determine through which route A. act. might communicate with S. mutans we deleted key genes of S. mutans. We analysed the transcriptomes of both species using RNA sequencing. Finally we asked if competence and mutacin synthesis might be expressed by S. mutans also in oral biofilms in vivo. To this end we extracted its transcripts from metatranscriptomes of periodontal pockets and analysed the expression of the SigX regulon. Microorganisms used in this study are listed in Additional file 1. A. act. ATCC 33384 was used in all experiments except for RNA sequencing where the “rough” strain HK1651 (CCUG 56173, Göteborg, Sweden) was used because it has a fully assembled and annotated genome. All cultures were incubated aerobically at 37 °C with 5% CO2 without shaking. Pre-cultures of S. mutans and A. act. strains were grown in Todd-Hewitt broth supplemented with yeast extract (THBY) (Becton, Dickinson and Company, Sparks, MD, USA). For the sigX reporter strain and deletion mutants, erythromycin (3 μg ml-1 and 10 μg ml-1, respectively) was added. Biofilms were cultivated in YNBB2 medium which contains 6.7 g l-1 yeast nitrogen base (YNB) synthetic medium (Difco Laboratories, Detroit, Mi, USA), 75 mM Na2HPO4–NaH2PO4 (pH 7.3), casamino acids (2 g l-1, Becton, Dickinson and Company) and sucrose (5 g l-1). The pH during biofilm growth was in the range 7.0–6.4. Biofilms grown on modified chemically defined artificial saliva medium (artificial saliva)  were used for RNA sequencing. Mucin was omitted from the medium, haemin was replaced with 1.2 μM FeCl3, 14.6 mM sucrose was added and the medium was buffered with 75 mM Na2HPO4–NaH2PO4 (pH 7.3). In some experiments, chemically defined mineral medium CDM  was used. For the construction of the hdrRM, brsRM and liaS deficient strains, the PCR ligation mutagenesis approach  was used. Primers are listed in Additional file 1: Table S1. Mutants were verified by PCR and sequencing. Crystal violet staining of biofilms, DAPI staining, fluorescence microscopic analysis and field emission scanning electron microscopy were performed as described . For quantitative PCR, extracellular DNA was removed from the biofilms, genomic DNA was extracted and S. mutans genomes were quantified as described . Quantification of A. act. genomes was performed using forward primer GGACGGGTGAGTAATGCTTG and reverse primer CCTTTACCCCACCAACTACC and the annealing temperature was 58 °C (modified from ). To convert nanograms of DNA to numbers of cells, 2.222 fg was used as the weight of the genome of A. act..
Culture supernatants were withdrawn, centrifuged (5000 rpm, 20 min, 4 °C), sterile filtered (0.22 μm, Roth, Karlsruhe, Germany) and frozen at -20 °C. S. mutans reporter strain SMP sigX GFP was grown in black Nunc 96 Well Optical Bottom Plates (Nunc, Langenselbold, Germany) in YNBB2 medium for 8 h. Cultivation media were removed and conditioned media (warmed to 37 °C) were loaded onto the reporter strain biofilms. Biofilms were further incubated for 3 h, supernatants were removed and the induction of sigX was measured as described . Biofilms of S. mutans, A. act. or both were cultivated in 24 well cell culture plates (Greiner Bio-One, Frickenhausen, Germany) for 4 to 24 h. After removal of the supernatants, biofilms were covered with 300 μl RNA Protect (Qiagen, Hilden, Germany). The biofilms were scraped off with sterile one-way cell scrapers, transferred to sterile Eppendorf tubes, centrifuged (4 °C, 5 min, 13,000 rpm), the supernatant was removed and the pellets were stored at -70 °C until RNA extraction. For RNA extraction the pellets were suspended in 0.2 ml lysis buffer containing 10 mM Tris, 1 mM EDTA (pH 8.0), 2.5 mg/ml lysozyme (Sigma-Aldrich, Taufkirchen, Germany) and 50 U/ml mutanolysin (Sigma-Aldrich, Taufkirchen, Germany) and incubated at 25 °C for 1.5 h at 350 rpm. Subsequently 1 ml TRIzol reagent (Invitrogen, Carlsbad, CA, USA) was added, samples were mixed and incubated at room temperature (RT) for 5 min. Cells were then vortexed for 30 s in the presence of 50 μg sterile, acid-washed glass beads (diameter 106 μm; Sigma-Aldrich, Taufkirchen, Germany). This was repeated 10 times with 1 min intervals on ice. Samples were briefly centrifuged, supernatants were transferred to new tubes and vortexed with ice cold 1-bromo-3-chloropropane (Sigma-Aldrich, Taufkirchen, Germany) for 15 s followed by 5 min incubation at RT. Samples were centrifuged (4 °C, 15 min, 13,000 rpm), the aqueous phase was collected, nucleic acids were precipitated with 1 volume of ice cold isopropanol, the solvent was removed and the pellet was suspended in double distilled autoclaved water. After removal of DNA with RNase free DNaseI (Qiagen, Hilden, Germany) using the in-solution digestion protocol, RNA was purified using the RNeasy mini kit (Qiagen, Hilden, Germany) according to the manufacturer`s instructions with additional DNaseI on-column digestion. Bacterial rRNAs were depleted using MicrobExpress (Ambion, Austin, TX). mRNA was converted to cDNA using ScriptSeq v2 RNA-Seq (Epicentre Biotechnologies, Madison, Wisconsin, USA). For sequencing 12 pM of each library was used and 8 samples were multiplexed on a single lane. Cluster generation was performed with cBot (Illumina) using a TruSeq SR Cluster Kit v3–cBot-HS (Illumina). Two biological replicas were sequenced for each treatment. In total two and half lanes (containing 20 libraries) were single-end sequenced for 50 cycles on an Illumina HiSeq 2500 sequencer using the TruSeq SBS Kit v3 - HS (Illumina). Image analysis and base calling were performed using the Illumina pipeline v 1.8. Sequencing data are available at Gene Expression Omnibus under accession number GSE75019. The S. mutans UA159 and A. act. HK1651 reference genomes (GenBank accession numbers NC_004350.2 and CP007502.1, respectively) were used. After clipping adapters and barcodes, reads were aligned with the reference genome using Bowtie 2 . HTSeq-count was used to count the mapped reads per gene (http://www-huber.embl.de/users/anders/HTSeq). Differential gene expression was calculated using the R package edgeR . Genes showing differential expression in dual-species biofilms (all time points compared to the 4 h time point, log2 fold change < - 2 and > 2; p < 0.01, were sorted into clusters using the c-means algorithm . The Rockhopper software was used to identify novel transcripts and determine operons . PRIMER & PERMANOVA+, (PRIMER-E, Plymouth, UK) were used to perform PCA analysis based on standardized log-transformed sequence abundances grouped to genes. The R package pheatmap was used to create heatmaps . To determine if A.act. is able to induce QS in S. mutans we co-cultured it with a reporter strain. S. mutans SMP sigX GFP carries a plasmid where the promoter of the alternative sigma-factor sigX, the master regulator of both competence and mutacin synthesis, is fused to GFP . Green fluorescence was measured during 24 h of biofilm growth. In the absence of a co-cultivation partner, no induction of fluorescence was observed in S. mutans (Fig. 1a). By adding the autoinducer XIP (sigX inducing peptide), strong fluorescence could be induced (Fig. 2a), indicating that extracellular XIP could be imported into the cells in this medium . Live, but not heat inactivated A. act. strongly induced sigX expression in dual-species biofilms (Fig. 1a). Fluorescence showed a peak after 10 h of biofilm growth and declined subsequently. Quantification of sigX expression by q-RT-PCR (Fig. 1b) similarly showed a peak at 10 h in co-culture. Both species grew better together than alone. Biofilm biomass increased continuously for S. mutans biofilms, but much stronger in the dual-species biofilm of S. mutans with A. act (Fig. 1c). At every time point the biomass of dual-species biofilms was at least twice that of single-species biofilms. A.act. did not form biofilms when grown alone, only small cell aggregates attached to the bottom of the wells were observed. q-PCR of the 16S rRNA gene revealed that cell numbers of S. mutans increased throughout the experiment and reached ~2 × 108 cells/well in mono-culture and more than twice that amount (~4.5 × 108 cells/well) in dual-species biofilms (Fig. 1d). A.act. reached ~ 6 – 8 × 108 cells/well in dual-species biofilms, but did not grow in single culture (Fig. 1e). The numbers of A.act. did not change significantly in dual species biofilms during the 6–12 h period. This implies that the increase in biofilm biomass during this time frame (Fig. 1c) corresponded to the increase in numbers and extracellular polysaccharides (EPS) of S. mutans. To test whether a compound excreted into the medium might be responsible for the induction of sigX we applied sterile-filtered supernatants from single- and dual-species biofilms (cultivated for 4 and 24 h) to biofilms of the S. mutans SMP sigX GFP reporter strain grown for 8 h; fluorescence intensity was determined after additional 3 h of incubation. Under these conditions, the reporter strain detected XIP concentrations above 0.25 μM (Fig. 2a). Supernatants of dual-species biofilms that had been cultivated between 6 and 12 h activated P sigX , whereas mono-culture supernatants had no effect, irrespective of how long they had been cultivated (Fig. 2b). The data show that it is a component in the culture supernatant that activates the sigX promoter, and that this component is not present in single species biofilm supernatants of either S. mutans or A. act. Therefore, it must be the result of an interaction between those two organisms. The time-course of activation of the reporter strain by dual-species culture supernatants is in complete agreement with the time course of fluorescence and sigX expression observed in dual-species biofilms (Fig. 1a, b). To investigate which regulatory systems of S. mutans might be involved in mediating the induction of sigX, we tested culture supernatants from deletion mutants of S. mutans (Additional file 1) co-cultivated with A. act.. Fig. 2c shows that in the absence of the autoinducer synthase ComS, an active compound could not be produced in dual-species biofilms. ComS synthesizes a pre-peptide that is cleaved and exported to yield the mature XIP autoinducer. By contrast, neither SigX nor the response regulator ComE and the mutacins NlmC and NlmAB are required to produce an active supernatant in co-culture with A. act.. Interestingly, the activity of the supernatants was slightly higher in biofilms of A. act. with S. mutans lacking the two gene regulatory systems HdrRM or BrsRM. The data suggest that the autoinducer synthase ComS of S. mutans is stimulated by an extracellular component produced in co-culture with A. act. to synthesize the XIP pre-peptide, which after export and cleavage needs to be imported again and can then induce transcription of sigX and downstream genes. Since this re-import of XIP in S. mutans is abolished in rich medium , we tested the influence of different media on the induction of sigX in dual-species biofilms. SigX induction was only observed in peptide-free CDMS medium and in YNBB2, but not in THBYS or artificial saliva (AS) (Additional file 2), although the biofilms grew on all media (Additional file 3). Interestingly, mucin inhibited sigX activation in a concentration dependent manner (Additional file 4a). It was therefore omitted from the artificial saliva medium used for transcriptome analysis. We then tested the influence of the histidine kinases (HKs) from the 13 two-component signal transduction systems of S. mutans on the activity of dual-species biofilm supernatants. Supernatants from A. act. grown in dual-species biofilms with deletion mutants of S. mutans lacking HKs were less active than those from S. mutans wild-type, most likely because the mutants have growth defects , but with one exception all of them were active (Fig. 2d). However, the supernatant from the ΔliaS mutant dual species biofilm was inactive over the full 24 h of growth with A. act. (Fig. 2e). This was not caused by impaired growth (data not shown). Subsequently, we tested the response of S. mutans ΔliaS to exogenous XIP. Mono-species biofilms of wild-type and S. mutans ΔliaS were cultivated with and without XIP for 8 h and the expression of the sigX gene was investigated using q-RT-PCR. In the wild-type, the expression of sigX was 200fold or 100fold induced by XIP, while it was only 2-5fold induced in the ΔliaS mutant (Fig. 2f), suggesting that this mutant is unable to import the XIP signal from the extracellular medium into the cell. We applied RNA sequencing to investigate the transcriptional activities of both S. mutans and A. act in dual species biofilms. Modified artificial saliva was used as cultivation medium to mimick the conditions in the oral cavity. We used the highly leukotoxic and adhesive “rough” strain A. act. HK1651  because its fully annotated genome is available. It differs in terms of serotype, morphotype and amount of toxins produced from the type strain. HK1651 grew together with S. mutans in a similar way as the type strain of A. act. and it also activated sigX, although with a slightly shorter duration in comparison to the type strain (Additional file 4b,c). We analyzed the transcriptome of both species in dual-species biofilms during (8 h) and after (24 h) activation of sigX in comparison to gene expression in mono-species biofilms. In addition the transcriptomes of both species in dual-species biofilms were analyzed at 6, 8, 10, 12 and 24 h of growth and compared to the expression at 4 h. In total, 513.4 million reads were obtained, providing on average 11 and 1.1 million reads per sample. 93% (S. mutans) and 84% (A. act.) of the expressed genes had a mean count per gene per million reads (CPM) higher than 10 (Additional file 4d-f). Using Rockhopper we identified 434 operons and predicted 204 small RNAs (including 71 antisense RNAs) in the S. mutans genome (Additional file 5). Principal Component Analysis (PCA) (Fig. 3) showed a good correlation between replicates and clearly separated single- and dual-species biofilm transcriptomes. Moreover, gradual changes in co-culture transcriptomes of each species could be observed during the 24 h of growth and expression profiles could be separated into several clusters clusters and groups of clusters (Additional files 6 and 7). Comparative analysis of biofilm transcriptomes of S. mutans grown alone and with A. act. yielded 260 and 246 differentially expressed genes (log2 fold change ≤ - 2 and ≥ 2; p < 0.01) for the 8 h and 24 h time points, respectively. The complete SigX regulon was induced in dual-species biofilms, including the DNA uptake apparatus (Fig. 4a) and the recombination machinery (Fig. 4b) suggesting that in co-culture S. mutans became genetically competent. The alternative sigma-factor sigX, the central regulator of QS, was among the most abundant transcripts and revealed a 72 fold change at 8 h (Fig. 4c). Accordingly, its primary target, the gene encoding the pre-peptide synthase ComS, was also highly upregulated. The ComDE two-component system that directly controls mutacin synthesis was slightly up-regulated, while the QS modulating CiaRH and the membrane bound protease HtrA were down-regulated (Fig. 4c). Mutacins also belong to the SigX regulon  and accordingly they were slightly up-regulated (Fig. 4d). Oxidative stress related genes, e.g. superoxide dismutase and chaperones, were repressed (Fig. 4e). Of the genes related to biofilm formation and adhesion, e.g. glucan binding proteins, some were up- and some were down-regulated (Fig. 4f). Carbohydrate metabolism of S. mutans most likely differed in the co-culture. Genes coding for exo-fructosidases, alpha-glucosidase and multi-sugar utilization enzymes (Fig. 4g) as well as sugar transport systems (Fig. 4h) were induced. Glycogen synthesis was induced especially at the later time-points (Fig. 4i). The expression of pyruvate dehydrogenase decreased in 8 h co-culture and was strongly induced at 24 h (Fig. 4j). Comparative analyses of transcriptomes of A. act. grown with S. mutans yielded 170 and 97 differentially expressed genes (log2 fold change ≤ -2 and ≥ 2; p < 0.01) for 8 h and 24 h, respectively. The main virulence factors of A.act. showed constant high expression irrespective of the tested condition. Leukotoxin was the second most highly expressed A. act. transcript (Additional file 5). The tight adherence (tad) locus that is required for the assembly of adhesive pili made up 21% of the total A. act. 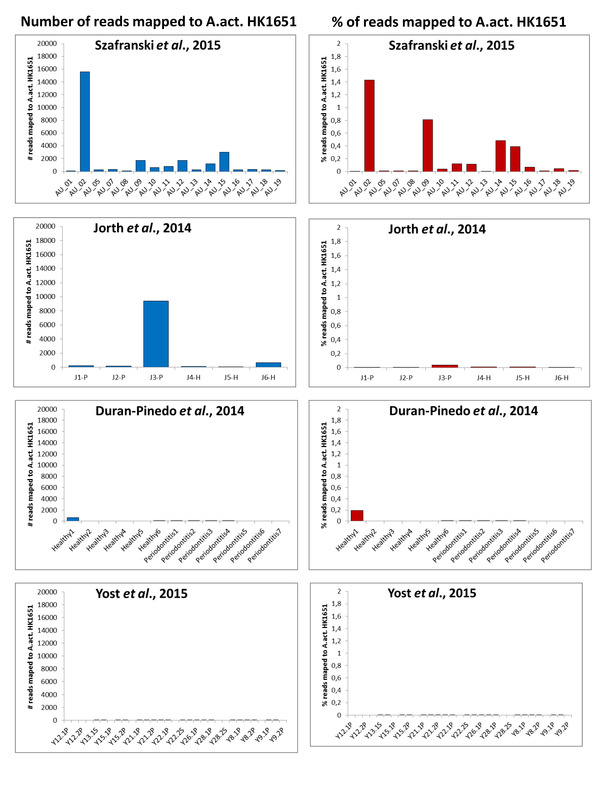 transcriptome and flp-1 was the most abundant transcript overall. The lsrACFG genes coding for an AI-2 transporter and AI-2 metabolizing enzymes were 8 fold down-regulated in the 8 h old co-culture (Fig. 5a). The autoinducer synthase LuxS was not differentially expressed. Iron uptake genes were up-regulated in co-culture (Fig. 5b) and changes in anaerobic metabolism likely occured: Fumarate reductase, malate dehydrogenase, formate dehydrogenase (FDH-H) and formate hydrogenlyase complex, and subunits of hydrogenase were induced, while the expression of formate dehydrogenase from the nitrate reductase complex (FDH-N) decreased (Fig. 5c). Genes coding for enzymes involved in nucleotide and DNA metabolism were induced especially in 8 h old dual species-biofilms (Fig. 5d) and expression of chaperones and heat shock proteins was up-regulated in the 24 h old co-culture. Quinol peroxidase  was most strongly (22-fold) induced in both 8 and 24 h co-culture biofilms (Fig. 5e). This enzyme reduces H2O2 to water using reducing equivalents from quinol, a component of the respiratory chain. The complement resistance protein ApiA (annotated as putative adhesion/invasion in strain HK1651) and catalase were 6-fold and 11-fold down-regulated at 6 h in co-culture (Fig. 5e). We found 316 and 309 genes of S. mutans and A. act., respectively, to be differentially expressed during growth in co-culture compared to their expression at 4 h. In S. mutans the competence and mutacin related genes were induced from 6 h onwards (Fig. 4a-d). From 10 h onwards the reprogramming of metabolism occurred (Fig. 4g-j). In A. act. the AI-2 metabolizing enzymes were repressed between 6 and 8 h (Fig. 5a) and induced at later time-points, in accordance with the up-take of AI-2 in late stationary phase during nutrient depletion. Iron sequestering was most strongly induced between 6 and 8 h (Fig. 5b). We observed the induction of stress response proteins, chaperones, and the ClpB protease (Fig. 5e). 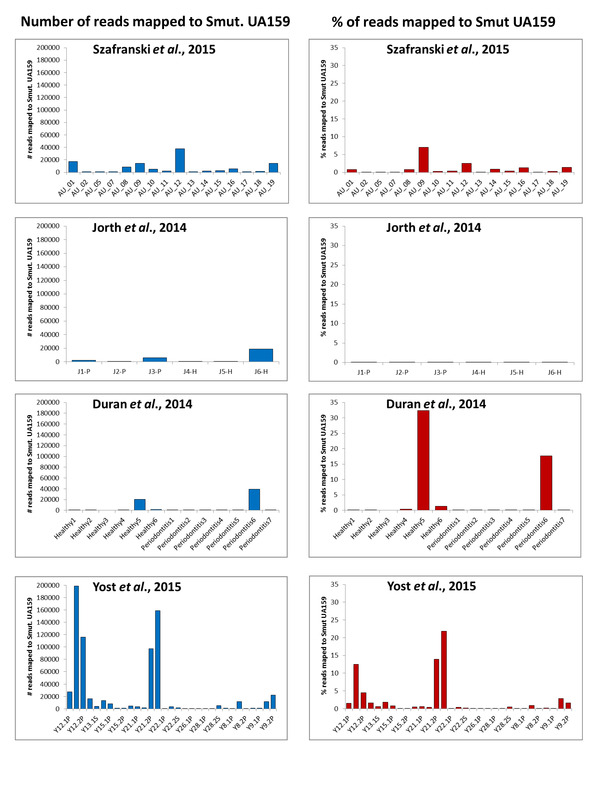 Additional files 8 and 9 show the total and relative number of transcripts from S. mutans and A. act, respectively, in four metatranscriptome studies of the periodontal pocket microbiome [16–18, 43]. Transcripts from both organisms were detected in all studies, although at low abundance in most samples. However, in some samples, 20 to 30% of all reads mapped to S. mutans UA159, showing an extremely strong contribution of this species alone to the community metatranscriptome in some patients. No clear correlation with health or disease was found, yet interestingly, S. mutans transcripts had the highest relative abundance in the study of Yost et al. who investigated periodontitis progression . Transcripts from A. act. were rare in all periodontal metatranscriptomes; the maximum value was found in a sample from a healthy individual, where they accounted for 1.4% of all reads. A detailed analysis was performed for samples with the highest numbers of reads (between 8347 and 37,798) which were derived from three healthy patients and one with chronic periodontitis . The expression level of the 50 most highly expressed genes of S. mutans is shown in Additional file 5. The transcriptional profile depicts an actively growing population: Genes for important metabolic enzymes (pyruvate-formate lyase, glyceraldehyde-3-phosphate dehydrogenase, glycerol dehydrogenase, sugar phosphotransferase system, glucosyltransferase, alcohol-acetaldehyde dehydrogenase, 6-phosphofructokinase) are expressed, as well as genes encoding RNA polymerase, glucan branching enzyme, surface antigen SpaP and the ATP-dependent protease ClpE. The competence related genes with an average abundance of transcripts ≥0.01% is shown in Table 1. The most strongly expressed competence related gene was the master regulator of QS in S. mutans, the alternative sigma-factor sigX (SMU_1997), which had an average abundance of 0.23%. Additionally, transformasome as well as mutacin related transcripts could be detected. The most strongly expressed bacteriocin was NlmC (mutacin V), which is also the most highly expressed bacteriocin in pure culture. Interestingly, transcripts of comC (SMU_1915), encoding the synthase for the precursor of the mutacin inducing peptide MIP were also detected (0.06%). Not all components of the SigX regulon were found, but since the overall transcript level of S. mutans was relatively low, this is probably due to lack of sequencing depth. Because of the low absolute number of competence related transcripts in periodontal pockets, it was not possible to calculate the difference in gene expression for transcripts with average abundance <0.01%. Significant (FDR < 0.01) differential expression was found for sigX, comFA, comC and a hypothetical protein (Additional file 5). The result for comC should be interpreted with great caution, because in two of the periodontal pocket samples (AU_8 and AI_19) no transcript of comC was found, while in the other two (AU_9 and AU_12) their frequency was low (0.212% and 0.010% of all transcripts). However, it is now known that competence is induced by SigX, while CSP, the product of processed ComC, controls mutacin synthesis only and was therefore renamed MIP (mutacin inducing peptide) . From all competence related genes, sigX was most strongly differentially enriched (log2 fold change 4.159, FDR < 0.001). A comparison of the expression of the QS related genes of S. mutans in dual and single species biofilms and in periodontal pockets based on percent of the respective transcript in comparison to the total amount of transccripts from this sample (Fig. 6) shows that biological replicates of in vitro cultures were almost identical, while periodontal communities showed large differences in the expression of QS related genes. However, sígX was not expressed in pure culture of S. mutans, neither during exponential growth nor in stationary phase, but was expressed in all four periodontal pockets, sometimes at levels similar (sample pp_8) or even higher (sample pp_09) than those in dual-species biofilms. Since SigX is the master regulator of both competence and bacteriocin synthesis, we therefore hypothesize that S. mutans is genetically competent in periodontal pockets. We found that cell-cell communication in S. mutans was induced by the phylogenetically distantly related species A. act.. Induction occurred by a component in the culture medium that was only produced in live dual-species biofilms and that was not produced any more upon deletion of comS of S. mutans. Thus, production of the ComS prepeptide was induced in co-culture, similarly as in dual-species biofilms between S. mutans and the fungus C. albicans . Leukotoxin and fimbriae are not likely to be involved since both the highly virulent strain HK1651 of A. act. and the “smooth” type strain induced QS in S. mutans. On the other hand, complex media containing components known to block the Opp permease required for import of the extracellular XIP  completely inhibited activation of SigX. This observation shows that the complete autocatalytic cycle of ComS synthesis, processing, export and import was activated in dual species biofilms. Since the stimulating factor is only produced in co-culture, it must be the result of an interaction between the two species in the biofilm. It is unclear if physical contact is required for the primary activation, yet since sterile filtered culture supernatants can activate SigX, this seems unlikely. Deletion of the histidine kinase LiaS of S. mutans (Smu.486) resulted in a strain that could not be induced by A. act. or by synthetic XIP to express sigX. LiaS is a sensor histidine kinase which represses glucan binding protein C (gbpC) transcription and induces synthesis of mutacin IV (cipB) . In our transcriptome data, gbpC was down-regulated, and mutacin IV was upregulated in dual-species biofilms with A. act.. Recently, the LiaR regulon was shown to be comprised of three genes, namely Smu.753, Smu.1727 and Smu.2084c . None of them was differentially expressed in dual species biofilms, which makes it very unlikely that sensing of a specific stimulus was responsible for the effect of LiaS on sigX induction. Since our data show that import of externally added, synthetic XIP was not possible in a ΔliaS mutant, we hypothesize that the cell membrane of this mutant was not permeable for XIP any more. Therefore we further hypothesize that exported XIP cannot re-enter the cell and the positive feed-back loop for XIP synthesis cannot be triggered. We show that mucin inhibited QS induction in dual-species biofilms in a concentration dependent way. Mucins are glycoproteins contributing to the antimicrobial activity of saliva , to which we can now add their ability to inhibit the QS of S. mutans. This might be caused by blockage of the Opp permease  that can then not import XIP anymore. Mucin concentration can be decreased in oral biofilms by streptococci  to levels which no longer block signaling. S. mutans down-regulated the expression of genes encoding chaperones and genes involved in oxidative stress in co-culture with A. act. suggesting that A. act. protected S. mutans from oxidative stress. Oxygen may have been depleted by the aerobic respiration of A. act.. Surprisingly, its catalase gene was down-regulated in co-culture, and stress and chaperone related genes were up-regulated, in contrast to S. mutans. The strong up-regulation of the quinol peroxidase gene also indicates oxidative stress for A.act.. These apparent inconsistencies might be caused by oxygen gradients in biofilms  and by differences in the localization of the cells within the biofilm . In dual species biofilms we observed tight balls of A. act. embedded in a thick layer of S. mutans cells (Additional file 10). Inside the balls, conditions were most likely anaerobic. Moreover, competition for iron uptake may have stressed the cells especially within the balls. Consistent with these observations, fermentation pathway enzymes were up-regulated in A.act. in co-culture. A.act. strongly expressed virulence genes both in the presence and absence of S. mutans. It was noteworthy that on average 20% of transcriptional activity of this organism was devoted to the tad locus producing adhesive fimbriae. The gene encoding leukotoxin was the second most highly expressed gene overall. Thus, in our experimental setup A. act. most probably maintained an extremely virulent form. Interestingly, the two genes involved in immune response evasion, encoding catalase KatA and the complement resistance protein ApiA, were repressed in our co-culture, while they were induced in co-culture with S. gordonii . This suggests that A.act. is more susceptible to the host immune defense in the presence of S. mutans, which might explain clinical studies which have found a negative relationship between caries and aggressive periodontitis . Our data show that S. mutans probably produces mutacins and is genetically competent in vivo, indicated by the relatively large number of transcripts of sigX as well as of many components of the SigX regulon. Moreover, the expression of comC, the gene encoding the synthase for the mutacin inducing peptide, was detected in dual species biofilms and in periodontal pockets, but not in biofilms of S. mutans alone, neither during exponential growth nor in the stationary phase. Apparently the QS system of S. mutans can be induced not only by C. albicans and A. act., but also by interaction with diverse members of the oral microbiome. The exact mechanism through which this occurs remains to be elucidated. The data suggest that QS of S. mutans is not so much a mechanism for orchestrating gene expression of its own population according to cell density, but a mechanism for adjusting its phenotype to the presence and activity of the oral microbiome. Killing competitors and using their DNA for genetic adaptation provides a powerful survival mechanism in complex communities, but is meaningless in pure culture. The complete quorum sensing regulon of S. mutans was induced by A. act. by an unknown mechanism which required the presence of ComS, the synthase for the XIP prepeptide. A. act. grew in a highly virulent form but down-regulated the genes important for escape from the host immune response in co-culture with S. mutans. Transformasome and mutacin genes of S. mutans were expressed in periodontal pockets, suggesting that its quorum sensing regulon is active in vivo. Because polymicrobial communities harboring streptococci and Aggregatibacter spp. are causing oral infectious diseases, the observed interactions may have an important role in the dysbiosis of such communities. We are grateful to Georg Conrads, Catherine M. Levesque, and Michael Reck for providing bacterial strains. JT was financed by the German Research Organisation (DFG) through the Transregio-SFB TRR-51 Roseobacter. ZD gratefully acknowledges support through the COMBACTE grant. The funders had not role in study design, data collection and interpretation or the decision to submit the work for publication. Sequencing data are available at Gene Expression Omnibus under accession number GSE75019. All data supporting our findings are contained in the manuscript and the eight additional files submitted as supplementary material. SPS conducted the experiments, analysed the data, and wrote the manuscript draft. ZD and JT performed bioinformatical and statistical analyses. SPS, ZD and JT prepared the figures. MJ and SB prepared sequencing libraries and processed the raw sequences. MR provided scanning electron micrographs. IWD and HS designed the study and supervised SPS. IWD finalized the manuscript. All authors read and approved the final manuscript. Cook LC, LaSarre B, Federle MJ. Interspecies communication among commensal and pathogenic streptococci. MBio. 2013;4(4):e00382-13. doi:10.1128/mBio.00382-13. Szafranski SP, Deng Z-L, Tomasch J, Jarek M, Bhuju S, Meisinger C, Kühnisch J, Sztajer H, Wagner-Döbler I. Functional biomarkers for chronic periodontitis and insights into the roles of Prevotella nigrescens and Fusobacterium nucleatum: a metatranscriptome analysis. Nature Biofilms and Microbiomes. 2015;1. doi:10.1038/npjbiofilms.2015.17. Haubek D, Johansson A. Pathogenicity of the highly leukotoxic JP2 clone of Aggregatibacter actinomycetemcomitans and its geographic dissemination and role in aggressive periodontitis. J Oral Microbiol. 2014;6. doi:10.3402/jom.v6.23980.